Sexual Harassment: Anita Hill to Speak at KC Public Library - Edelman, Liesen & Myers L.L.P. Everyone has a right to work without being subjected to abusive, demeaning, and harassing comments and conduct. If you are facing sexual harassment at your job, it is important to find an attorney who can assist you in protecting your legal rights. Many attorneys, including those at Edelman, Liesen & Myers, offer free consultations, and can sometimes take these cases on sliding scale or contingent fee basis. You shouldn’t avoid addressing the issue because you do not think you can afford an attorney. 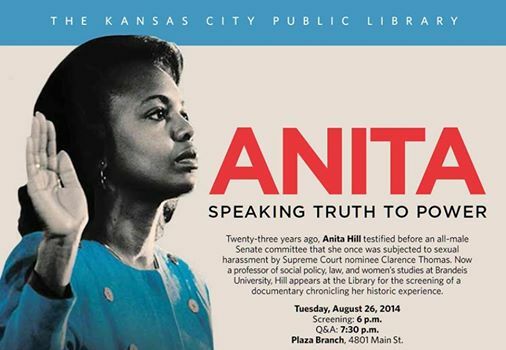 The Kansas City Public Library is hosing a screening of the documentary “Anita: Speaking Truth to Power” followed by a question and answer session with Prof. Anita Hill herself. Prof. Hill bravely stood up to some of the most powerful men in the world and spoke her truth, and in doing so raised awareness of sexual harassment in our country in a way that it had not before been known. Her testimony empowered many women to seek redress for the intolerable conditions they had been told was simply a part of their job, and it was an milestone in the history of civil rights in our country. We are extremely grateful to the Library for hosting such an important film and speaker speaker, and encourage everyone who can to go see this movie and hear Prof. Hill speak.